CT Kenpo Karate has classes built for children starting at age four and adults at any level. Our instructors are Black Belt certified and we offer convenient class times. Whether you want to progress to the next level or want specific training our one-on-one training sessions can help you achieve your goals. Our highly skilled group of young martial artists is available to spread the benefits of karate through an exciting half hour demonstration. At Connecticut Kenpo Karate you can learn self-defense, get in shape, and gain confidence. 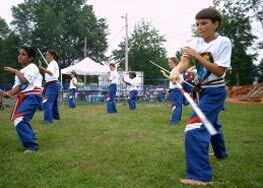 We offer group karate programs and classes for children, adults, as well as one-on-one personalized training. Our karate programs are structured for enthusiasts at any level. Our 2,250 square foot modern facility is located at 135 Lowrey Place in Newington, CT. Our karate instructors are certified black belts and we teach with an emphasis on practical self-defense. Connecticut Kenpo’s Demo Team is our highly skilled group of young martial artists and is available to spread the benefits of karate through our exciting half-hour demonstrations.